I’ve tried tonnes of different skincare products over the years but I’ve rarely switched up the method I use to wash off my cleanser. For a while I was a slave to the muslin cloth, then I switched to a regular flannel and never looked back (I love the exfoliation). But even so, I couldn’t resist trying out this Bamboo Charcoal Face Sponge* from the Konjac Sponge Company. I have spot-prone combination skin with plenty of oiliness on the T-zone, so the bamboo version was ideal. 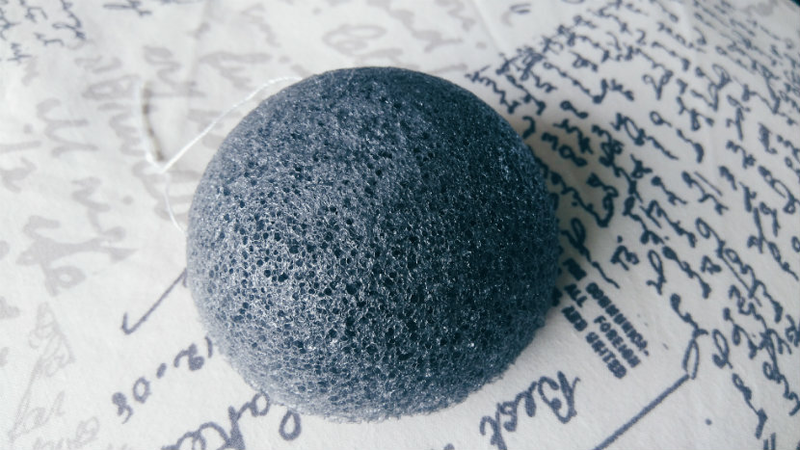 According to the Konjac Sponge Company, bamboo charcoal contains minerals that ‘enhance absorptive ability’, a rather eloquent way of saying that they help to mop up excess oil. Bamboo charcoal helps to fight bacteria (which can cause acne) but it shouldn’t upset sensitive skin — thankfully I didn’t notice any irritation while I was using the sponge. The sponge itself is 100% natural, made from konjac, and free from colours and additives. It’s biodegradable, so you don’t have to worry about its effect on the environment once you’re done. This is probably my favourite thing about the Konjac Sponge Company; I’m always very impressed when a company takes environmental issues into account as well as animal rights (often the two go hand-in-hand). I did worry about the sourcing of the bamboo (gotta take care of the pandas!) but since it’s grass it grows at a fast rate and the company assure their customers that it’s sustainable. Wash the sponge thoroughly, making sure it has fully absorbed the water. Gently massage the face in a circular motion (you can add a little cleanser if you want a deeper clean). You don’t always need a cleanser. You don’t have to remember to chuck your flannels in the wash. There are different versions for different skin types. It costs £8.99, so it won’t break the bank. It lasts for several months. It doesn’t mix well with my acne cream in the mornings. I was never sure if my skin was completely clean, especially at night. The sponge doesn’t dry out fully and I’m at work during the day, so I can’t turn it over to ensure both sides get an equal amount of air. It doesn’t work very well with balm cleansers (the balm clogs up the holes). I love the idea of a konjac sponge in theory but in practice it just didn’t suit me — Ultrabland and my acne cream have to take priority. Have you ever tried a konjac sponge before? What did you think of it? Let me know in the comments!